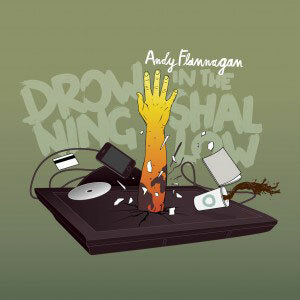 Andy Flannagan’s new album, Drowning in the Shallow, zooms right in on personal brokenness, and simultaneously pans out to tell a universal story of hurt and hope. Musically familiar, with his strong vocals, clean guitar and layers of strings, the listener is immediately made aware that there’s more to be heard here than just pleasing chord progressions. The album doesn’t attempt to be anything more than it is, which is a collection of stories told with a clear-sightedness that middle class Christianity in the West usually prevents. It’s a personal compilation of Flannagan’s experiences of witnessing suffering in varied forms and places, and the unavoidable and often uncomfortable readjusting of heart and perspective that follows. This clear vision and frank honesty can probably safely be attributed to Flannagan’s social and political activism, which surge through the current of the album – revealing first the confusion and compassion of being faced with a vividly broken world, and moving in the concluding songs to rouse a sleeping, comfortable Church to be radical and generous in their heart and action for the abused, neglected and hurting: “We need an army/to storm this front/to reach for the broken/and touch the finger of God” (I Will Not Be Leaving). So how is this harsh confrontation with the agony of the world bearable? Flannagan talks in Fragile of how this agony, as well every part of life, is part of a greater story, as he recounts Jesus going before us and bearing the ultimate adversity: “But this same man knows more than me about suffering/so calm this overwhelming force/‘cos earth and heaven seem divorced.” How appropriate that to end an album that observes, hurts and aches for change, the final song, Fall, should repeat the motif “so I’ll fall down at your feet”. For up-to-date news and photos on Andy Flannagan, like him on Facebook, where you can also get a free MP3 download of his album. Can you be a Christian and… eat Kit Kats? // In and of itself, boycotting doesn't work, doesn't change anything and is lazy campaigning.